Stavin Kel'Aniston is a brave man in a boy's body. Encountering a dragon, he proves his courage and receives a gift beyond imagining. Book One in the Stavin Kel'Aniston Dragon Blessed series. Stavin Kel'Aniston struggled up the steep slope of the crater's side, through deep snow and line after line of thicket, trying to get to the cave located on the crater's highest peak. He paused and scraped the top layer of snow off a drift in search of some clean snow to quench his thirst. He had started with a full water bottle and enough food for five days, but the climb had been harder than he expected and his water had run out after just three days. His food would last only one more day, but that didn't matter. He was determined to succeed, or die trying. He looked down at the valley, through a gap where the trees had been scoured away by a landslide, and gazed at the smoke rising from the chimneys of distant Kavinston. He clenched his fists in anger as he looked at his home. The town was nearly obscured by the distance, but he imagined he could see the people in the streets. Hear their laughter at the idea that he might dare the cave. Hear the derisive laughter of the only person who mattered to him as she called him a runt. Turning away, he looked at the last thicket he must cross to reach the cave. The thicket was a long, straight line of juniper trees that looked like they had been deliberately planted by someone. Legend claimed they had been, but not by a man. Supposedly, they had been planted by a dragon as his hedges. Stavin discounted that as pure fancy. What he didn't discount was the legend of the dragon's gold. Everyone knew there had been dragons in the old days. After all, the Empire of Luxand had been founded by the dragon Dandarshandrake. Other dragons had been seen through the centuries, though few humans had been blessed by their attention. A dragon had often been seen soaring majestically above the valley back when Kavinston was being built, but it had been ages since it had last been spotted. The stories of the dragon's gold had been around since an intrepid youngster had chased a wounded deer into the cave more than a hundred and fifty years ago. He'd gone in after it, then stopped in his tracks when he saw a huge pile of gold. Supposedly, terror had gripped the boy's heart as a long, low moan filled the cave, and he'd run for his life, forgetting the wounded deer and the gold in his fright. He had run all the way down the mountain to the village and told the Elders what had happened. The Elders of Kavinston had sent a band of stout warriors to investigate the cave. Only four returned three days later. They confirmed the boy's story of a dragon's hoard of gold, and added to the legend of the terror. Their leader had been much farther into the cave than the rest when the terror hit, and he hadn't won free to the sunlight with the others. His screams had echoed horribly, only to be followed by an even more ominous silence. The survivors had fled down the mountain as fast as their horses would carry them, and none of them would ever climb that mountain again. Some years after that incident, two foolish boys had dared one another to go into the cave and prove their bravery. They had both entered as their friends watched. But both had reportedly emerged at a dead run just a few moments later. The second to emerge claimed to be the bravest because he had stayed the longest. And so had begun the foolish tradition of boys proving their bravery in the dragon's cave: That was why Stavin was making his lonely journey now. Stavin struggled through the last line of thicket and saw the mouth of the cave, just as it had been described. It was a pitch-black, irregular circle in the side of the mountain, near the summit. The edges of the opening were smooth, as if they had been worn down by the passage of countless hands. A shiver of fear shook his slight frame, and he made no effort to hide it. There was no one to hide it from. No one had come with him. No one believed that he'd really do it. No one believes I have the courage, he thought. That thought burned in his mind and started his legs moving once again. Stavin approached from the side and peeked around the edge into the darkness, but he could see little of the interior. Gathering the last shreds of his courage, he crept into the cave. Stavin walked until he couldn't see where he was stepping, then stopped and let his eyes adjust for a few moments. When the impenetrable darkness had been replaced by a deep gloom, he walked forward. Then, suddenly, as if it had been hidden by an outcropping of stone, he saw the treasure glinting in a shaft of sunlight. The mound of gold was as tall as two grown men standing one on the other's shoulders, and as long as the cave was wide. Then The Terror struck. Wild, unreasoning fear grabbed Stavin's heart and squeezed. He gasped for breath as his knees shook uncontrollably. His bladder and bowels threatened to let loose and shame him. Yet, for all his fear, he didn't run. He couldn't. I'd rather die than go back without proof that I really went into the cave. Gathering his breath, he shouted, "I won't run! I won't!" New terrors assaulted his senses. Barely seen shapes flitted through the darkness at the corners of his sight. Shadows moved and writhed as if they were tormented spirits. The sounds of moaning and screaming assaulted his ears, and still he stood his ground. "No!" he screamed. "I won't let you frighten me away!" Suddenly the fear was gone, and Stavin fell to his knees in relief, gasping for breath. "You really won't run?" a deep, echoing voice asked. "You are alone," the voice said softly. "Who do you think to prove your bravery to?" "Myself!" Stavin shouted, bolder now that he was still alive. He struggled to his feet once again and stared at the pile of gold. A sound like a gigantic sigh filled the cave. "Kids," muttered the voice. "And what do you desire as proof of your bravery?" "Gold! As much as I can carry," Stavin shouted into the darkness. That'll show 'em. That'll prove how brave I am. Harsh laughter echoed through the cave. "Is that what the last hundred and sixty years have been about? You have indeed come on a fool's errand, boy, for there is no gold here." Stavin got angry when he heard that. He could see it plainly before him. He shouted, "No gold? What's that if it's not gold?" as his hands balled into fists. The mound of gold seemed to shimmer, then it moved. It rose toward the roof of the cave, and part of it unfolded toward him. The center lifted from the floor, and he could see what looked like legs underneath. Then a long, sinuous neck swung a wagon-sized head around to bring two golden eyes the size of battle-shields to focus on him. "You mean me?" the voice asked, and Stavin realized how foolish they had all been. It wasn't the dragon's gold that they had been trying to steal: it was the dragon itself. Stavin stumbled backwards and tripped on a rock, landing on his backside. "Don't eat me. Please don't eat me," he pleaded in a little boy's voice as the dragon's head swung closer. The dragon considered him for a moment, then snorted. "I don't eat humans. You surprise me, boy. Most grown men would have run screaming for the sunlight, messing their britches the whole way if I turned on them like that. You are braver than you believe." "But no one else believes," Stavin whispered. "None of them believed enough to come and see if I'd even enter the cave. Not one of them. Not even-you wouldn't understand." The dragon's head nodded. "I understand better than you might think." "And now I'll go back empty-handed, and no one will believe that I really came in here." "There you are wrong, boy." 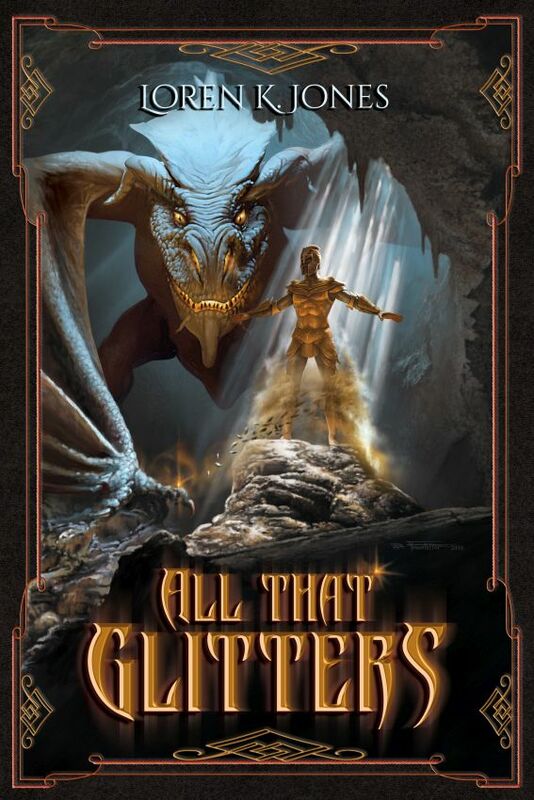 The dragon shook itself like a wet hound and a sprinkling of golden scales fell to the cave's floor. "Be a good lad and gather those up," it commanded, and Stavin automatically did as he was told. "Good enough. What are you?" "I'm a human," Stavin answered softly. "Don't try my patience, boy, or you'll be bear-bait," the dragon snapped. "What do you do? Are you a warrior?" "Yes. Or, I will be when the spring draft comes and I take my place with the others." "What is your weapon?" the dragon asked. "The Dragon's Tongue," Stavin answered, then wished he hadn't. "What is that? I've never heard of it before," the dragon asked, tilting his head to the side. Stavin was relieved to still be alive, so he explained. "It's a quarterstaff with a spear point at each end." "Odd name," the dragon commented. "Why is it called that?" Stavin thought for a moment before answering, "Because it has two points, is very sharp, and can cut both ways." The dragon actually chuckled. "Heh. Now that's truth if I ever heard it. What armor do you wear?" "Breast and back plates, thigh and shin guards, chain-mail leggings, a long chain-mail coat and cap, a helmet, and armored gauntlets," Stavin answered. "Why do you want to know?" "You'll see. Now shut up for a moment." Stavin suddenly found himself in the center of a circle of bright light, surrounded by a whirlwind made of the dragon scales he had collected. His arms were abruptly pulled out straight from his sides and his clothes vanished. As he was taking a breath to protest, he was magically clothed head to toe in a soft, felt-like material that looked like spun gold. Golden chain-mail rattled and chimed as it made itself around him. Tall gauntlets formed around his hands, but only the backs of the gloves were armored. Breast and back plates snapped around him like a mussel shell. Thigh guards wrapped his upper legs, and shin guards with knee cups wrapped his lower legs. There were even plates that extended out over his boots. As he looked up at the dragon, he could see the reflection of his armor in its eyes. He was filled with wonder as a helmet formed around his head in the shape of a dragon, its body forming the dome of the helmet while its wings formed cheek guards and the neck and head formed a nasal guard. When Stavin looked at his hands, a brightly shining staff appeared, then transmuted into a Dragon's Tongue. "You have all the proof you need, and more courage than any man before you. Now get out of my cave." The light was suddenly gone, and Stavin stumbled and swore as he made his way to the circle of light that marked the entrance of the cave. He stopped at the edge of the light and shouted back over his shoulder, "Thank you," but he received no reply. He stood with his back against the edge of the cave for a moment as his knees shook. He'd done it. He'd done what no one had ever done. I faced The Fear. And he was alive to tell the tale. Now Barvil will say yes. Now Dorvina will accept me, even if I'm not as tall as her chin. Now everyone will have to accept me as a real man, and not a runt. Now I have proof no one can deny. The people of Kavinston didn't recognize the gold-clad figure that walked into town near the middle of the next day. Warriors came running with weapons in their hands as the Elders hurried to confront the intruder just inside the town gates. "Halt where you are, stranger," the Chief Elder said, holding up his hand, palm out. Stavin stopped as commanded, but he was puzzled. Then he realized that they couldn't see his face and removed his helmet. "Chief Elder Kel'Davin, it's me, Stavin. I've been to the dragon's cave." Another of the Elders pushed forward and looked down at him. "You expect us to believe that? Where did you get that armor?" Stavin looked up at the Elder and, for the first time in his life, found that the man's aggression didn't frighten him. "I'm wearing my proof, Elder Barvil Kel'Carin. The dragon gave it to me because I faced the fear and didn't run away." "The dragon has been gone for decades," the Elder snapped. The crowd murmured and laughed. Stavin shook his head as he answered, "No, Elder Kel'Carin, he has been there. The great mound of gold that everyone has seen isn't his hoard of gold coins. It's his scales. That's what he made this armor out of." "Liar," Elder Kel'Carin snarled, then stepped forward and reached for the Dragon's Tongue in Stavin's hands. Stavin stepped back and brought the weapon to the ready, stopping the angry Elder in his tracks. "You dare challenge me?" the Elder hissed, then held out his hand imperiously to one of the warriors. "If you won't surrender it, I'm just going to have to take it from you." He caught the weapon that had been tossed to him without looking at it and took a ready stance. Stavin put his helmet back on and flexed his knees. "I will not let you take what is rightfully mine," he snarled defiantly as he prepared to fight one of the mightiest warriors in the valley. Elder Kel'Carin sneered and took a contemptuous swipe at Stavin's legs, but Stavin met the attack with ease. Instead of backing away, he attacked, following the maxim that it is always better to lead when dancing with steel. The staccato clacking as the two weapons met was the only sound as they fought. Stavin was just trying to keep the Elder at bay and not dishonor his name, while Elder Kel'Carin's face was turning red and an expression of rage was twisting his features. Stavin fought with all the skill he had, trying to keep Elder Kel'Carin from scoring on him. This was the man he most wanted to impress, the man who had driven him to the extreme of going to the dragon's cave in the first place. The man he had faced in a different arena twice already and been turned away. The father of the lovely Dorvina Kel'Carin, the girl Stavin wanted for his wife. The lack of food and sleep coming down the mountain was making Stavin slower than usual and he let his guard down for just a moment. In that instant Elder Kel'Carin struck, driving his borrowed Dragon's Tongue forward as hard as he could, through Stavin's defenses, and into Stavin's chest, where it-stopped. The finest steel the smith could produce met dragon scale and failed. A point that would pierce the finest armor made by man turned when it hit armor made by a dragon. Stavin was knocked back a step by the force of the blow and stunned by the implications. Elder Kel'Carin wasn't just trying to score a blow against him. The thought, He's trying to kill me! flitted through Stavin's mind as he staggered backwards. Elder Kel'Carin was standing still, as if frozen by the implications of what he had just tried to do. He had just tried to kill a child of the people, an untested boy of the Cat Clan of Aniston. To kill a child was the most dishonorable act a man could commit. The crowd roared in protest, but Stavin was focused on the vile act of the man before him. That's dishonorable! How could an Elder do that! I've proven myself! Anger that had been smoldering burst into flame and the Dragon's Tongue in his hands flashed in the sun, slicing off one, then the other point from the frozen Elder's weapon, then flashed a third time to cut the haft of the weapon in half in contempt. Stavin continued to whirl his weapon for a moment, then abruptly came to a stop with his weapon held vertically in front of his chest in the traditional salute of the victor to the vanquished. Relaxing, he let go with his right hand and put the weapon at rest against his left shoulder. Looking past Elder Kel'Carin, he addressed the crowd. "No one would come with me to the dragon's cave six days ago. No one saw me enter the cave to get the treasure. I faced the fear alone, to prove my bravery to myself since none of you would let me prove it to you. I faced my fear and conquered it. I learned the truth: the dragon never left our valley, and he's still here. He gave me this armor and Dragon's Tongue, made from his own golden scales, as a reward for my courage. I was the only one who didn't run away." Chief Elder Kel'Davin stepped past the disgraced Elder Kel'Carin and faced Stavin squarely. Even as shrunken and bent with age as he was, he had to look slightly down into Stavin's eyes, but his own eyes held nothing but respect. "Stavin Kel'Aniston, you have indeed proven yourself this day. Your proof is not in the armor you wear or the weapon in your hand. Your proof is not in a cave on the mountain. Your proof is that you fought honorably against Elder Kel'Carin and remembered the law of our people when he had clearly forgotten it. He tried to kill you, but you spared him when the advantage came to you. Honor, above all else, is the proof of a man." He glanced over his shoulder at the man who had been at his right hand for years, then walked away without another word. When the Chief Elder turned away, the rest of the town's folk turned away as well and returned to their interrupted lives, discussing what they had seen and the revelations that Stavin had presented them with. Only three people remained where they had been standing. Karlit and Marinis Kel'Aniston stood straight and proud as their youngest child, and greatest heartache, was accepted as a man by their people. Barvil Kel'Carin remained where he had been standing since his dishonorable act, head down in shame. Stavin walked around the shamed Elder to face his parents. His voice was soft as he said, "I told you I would return a man, or not at all." Karlit reached out and grasped his son by the upper arm. "That you did, and I'm ashamed to admit that I never thought I'd see you again." Marinis clasped her son's other arm with a grip that was stronger than her husband's. "I was afraid that you would keep going over the mountain and down into Kavadia, or that the next bunch to go up there would find your bones." She smiled through her tears and tapped his golden breast plate. "I certainly never expected this." Stavin removed his helmet again and smiled sheepishly. "I didn't either. I thought I was going to die in the cave or go mad. Either would have been better than living here, scorned as a coward and never being anything but a servant in someone else's household." Karlit looked past Stavin to where Barvil Kel'Carin still stood staring at the ground. "And now?" he asked as Stavin followed his gaze. "And now," Stavin repeated softly. Turning, he stood squarely looking at the man's back. "Face me," he commanded, and the shamed elder turned, head still down. "Do you have something to say to me, Elder Kel'Carin?" "I am no longer an Elder. You have dishonored me in the eyes of our people." "You dishonored yourself," Stavin snarled as he looked the man up and down. "By the customs of our ancestors, your life and all that you possess now belong to me. Also by custom, you have the choice of accepting me as your master or taking your own life to regain your honor." Barvil finally looked up and stared Stavin straight in the eye. "I will live with the shame my pride has brought upon me. I will regain my honor as a man may, servant or no." Stavin nodded once. "So be it. You may present me to my household." Barvil nodded and motioned for his new master to precede him. "My-Your house awaits you. I believe you know the way." Stavin nodded, then turned to look at his parents. "I-"
"We know. Go settle your household. If you need us, we are close by," Marinis said as her husband nodded. Stavin walked away with Barvil a respectful step behind. The walk was a long one, all the way across town, and just about everyone turned away when they saw the pair. Barvil's shame was a raw wound for the entire population. He had been the favorite to replace Sorval Kel'Davin as Chief Elder when the other retired or died. When they reached the house, all of the Kel'Carins were lined up on the front porch waiting for them. Barvil stepped forward to face his family. "My family, I have dishonored myself, and placed us in servitude to Stavin Kel'Aniston. He is now master of this house and all who dwell within." Sahrena Kel'Carin nodded. "We saw your dishonor, my husband." Turning to Stavin, she bowed deeply. "Master Stavin, we welcome you. This house and all in it now belong to you, but I would presume to remind you of this: Custom forbids a man congress with a girl of his household who is not his wife." As Stavin looked into her eyes he felt his heartache renewed. "And so you remind me that even though I have proven myself, Dorvina can still never be mine, for no honorable man may take to wife any girl or woman of his own household." He looked past Sahrena to the Kel'Carin's oldest child and felt the emptiness in his belly grow. "Even so, you get your way," he whispered. Dorvina answered him boldly. "Not entirely, and not in the way I would have chosen, but it will do." Her words burned like acid on Stavin's bleeding heart, and Sahrena took control before anything unfortunate could happen. "I have already moved our things out of the master's suite. If you will follow me, I will see you settled." Stavin nodded and followed Sahrena through the house. Though he had been there dozens of times in the past, he had never entered Barvil and Sahrena's rooms. The master's suite was made up of three rooms. The first room was the library. Shelves of books lined the walls, though there were bare places where books and small objects had obviously been removed. Next was the bedroom, and again it was obvious that many small items had been removed, but Stavin said nothing. While custom made everything in the house his, custom also allowed servants belongings of their own. By not saying anything now, Stavin was acknowledging that those missing items belonged to Barvil and Sahrena. Last was the armory. This room was bare except for the armor stand. Barvil's armor and weapons remained his so he could regain his honor in service to the town. "If you will stand here, Master Stavin, I will help you with your armor," Sahrena said in a soft voice, but Stavin shook his head. "Send Kar to help me, please. I'm-I don't want-"
"As you wish, Master Stavin," Sahrena replied with another bow. As she turned to go, Stavin thought of something. "Please send someone to my parents' house for my clothes." Sahrena again nodded and said, "As you wish, Master Stavin." Then she left, closing the door behind her. Sahrena had only been gone for a few moments when there was a knock at the bedroom door. Stavin said, "Come," without looking. He heard the door open and turned to find a figure standing by the armory door. "You sent for me, Stave-Master Stavin?" Karvik asked in a near whisper. Stavin waved a hand for him to enter the room. "I need help with my armor, Kar, and I was embarrassed when your mom tried to undress me." "Mom's that way. You know that. Stand tall," Karvik commanded and Stavin raised his arms slightly so Karvik could get to the straps on his sides. Even though Stavin was older by nearly two years, he still had to look up into Karvik's eyes. Karvik reached up and started undoing the shoulder straps that held the breast plate to the back plate. "How did you manage on your own coming down the mountain, Master?" Stavin sighed deeply. "This is so awkward. Coming down the mountain was easy: I didn't take it off. I only had one night, and it wasn't that bad sleeping in it. Not that I slept all that much." When the breast and back plates were off and hung on the rack, Karvik helped remove the rest of the armor. Then came the mail. "This is finely woven mail. It fits you like a glove. What are you going to do when you start growing again?" Stavin shrugged as he squirmed out of the mail coat and leggings. "I don't know, Kar. A year ago I was taller than you, but now you're taller by a hand. I haven't grown a finger in five years." Stavin finally got all the mail off, revealing the fine golden cloth beneath. "At least the dragon made the bottom half easy to get down." That comment drew a snort of amusement from the younger boy. "First rule when choosing armor: Make sure you can squat in a hurry if you need to." Stavin laughed. "Warmaster Kel'Horval certainly makes that lesson memorable, doesn't he?" he said with a grin. "I don't know how the dragon knew, but he obviously did. Do you know who your mother sent to get my clothes?" "Zahri," Karvik replied with a grimace. Stavin groaned. "Great! She might be back by sundown. I'll just have to wear this until then." Karvik grinned. "She's not really that bad, Stave. Master Stavin. Do I have to keep calling you 'master' all the time?" Stavin shrugged. "I don't think so, but we'd better ask your mom. I don't care what's changed, I'm still afraid of her. I don't want to make her mad." Karvik nodded. "Good idea. Not making her mad is always a good plan, even if she can't really do anything to you anymore." Stavin collapsed on to the bench and put his head in his hands. "Why did your dad try to kill me? I still don't understand. It's against all of our customs." Karvik leaned against the wall. "I don't know, Stave. He probably just got mad and lost his temper when you defied him. Defiance really infuriates him, and he's been getting plenty of that from Dorvi lately. Or he may have thought you were lying about staying in the cave. You know how all of the Elders get when they think someone is lying to them." "But I wasn't lying," Stavin whispered. "I did stay. Look at this cloth. Have you ever seen anything like it?" Karvik shook his head. "No. It looks like spun gold. It feels like fluffy cloth, but it's shiny like metal. Stave, no one has ever stayed in the cave. Never. Dad didn't when he was a boy." Karvik paused and pursed his lips. "That may be what made him so mad. You're claiming that you are braver than he was." "Now that, my friend, sounds more reasonable than him thinking I was lying. The last time I got caught lying I had to haul water for a moon." "You're probably right," Karvik agreed, but was interrupted by a knock at the door before he could say anything else. They both went out to the bedroom and Stavin said, "Come in." The door opened to reveal a bundle of clothes with a pair of skinny legs sticking out of the bottom. "Here are your clothes, Master Stavin," a voice said from somewhere as the legs started forward. Karvik saw the wrinkle in the carpet and said, "Zahri, be careful, you're going to-" Zahrinis's foot hit the wrinkle and sent her and the clothes tumbling to the floor. "-trip." Zahrinis scrambled to her feet, snarling at her brother, then turned shame-faced to Stavin. "Please forgive my clumsiness, Master Stavin." Stavin was struggling not to laugh as he said, "It's all right, Zahri. Why don't you go help your mother?" Zahrinis bowed very low and said, "Yes, Master Stavin. Thank you." The look she gave her brother said far more as she turned away. Stavin and Karvik managed to stifle their laughter until she had closed the door, then they picked up the clothes. Karvik put out a hand to stop Stavin when he tried to help. "You're the master here. Let me do it." "I don't know how to be a master, Kar. I've always just been the third boy. I follow orders, not give them." Karvik fought not to sneer at Stavin's self-pitying tone. "You have to learn. Master. All of the decisions about how this household is run are now yours to make. Master." Stavin sat on the edge of the bed and put his head in his hands. "I'm not ready to be the head of a household, Kar. I don't even have my trade yet. I've never won in battle. I've never even fought in a real battle." "You fought and won against my dad," Karvik said hotly. "Master." Stavin looked up at the tone of Karvik's voice, then looked down again. "I wish I hadn't." Neither boy had noticed that the door had opened again until a deep voice said, "I'm glad you did," from the doorway. They both immediately scrambled to their feet. "If I had killed you, we would have been outlawed. Dispossessed, cast out of our home and people, bereft of everything. Your armor saved me from condemning my family, and for that I am truly grateful. With your permission, Master Stavin, Kar is needed in the kitchen. I'll see to you now." Stavin nodded and said, "Yes, Sir," automatically, then flushed with embarrassment when Barvil raised an eyebrow. "I meant, very well, Eld-Barvil. Kar, go do whatever your mother needs you to do." Karvik turned and started walking toward the door, but his father's growl of anger made him turn around. Barvil angled his body slightly, and Karvik remembered his manners enough to bow deeply to Stavin before he left. "I don't care if he doesn't do that," Stavin said as Karvik closed the door. "You should, Master Stavin. I certainly do. He has to help regain the family honor, and he can't do that if he doesn't remember his place at all times. You two are no longer friends and equals, Master Stavin. You are the master, he is the servant, not just here, but throughout the town. Our status has changed, and he must remember that. At all times." Stavin looked at Barvil for a moment, then said, "Yes, s-Barvil. But it's hard." Barvil nodded sagely. "Responsibility always is, Master Stavin. Shall I help you dress?" For a moment Stavin was horrified and enraged by the notion that Barvil didn't think he could dress himself, but he quickly realized that Barvil was just doing what tradition required him to do: Being a servant. "No, thank you. I'd prefer to do it myself. You can go do-whatever you think needs to be done. I'll be along shortly." Barvil bowed deeply and said, "Yes, Master Stavin. Sahrena should have the mid day meal prepared soon." He turned and left the room silently, closing the door softly behind him. When he was alone again, Stavin sat on the edge of the bed and put his head in his hands. He'd made so many plans on the long trek down the mountain. He'd planned on presenting the proof of his bravery to Barvil and Sahrena and petitioning once again for Dorvina to be his wife. They would live with his parents. He would make his trips to the lowlands and apprentice in the off season with Master Scribe Kel'Zorgan, and would become the town scribe in his turn. During the warm season he would join the draft of young warriors who were hired out as caravan guards. Warmaster Kel'Horval said he was ready, though he'd taken an extra year to get there. Now, because he'd decided to stand up for himself, those plans were just so much smoke up the chimney. Stavin shook his head sharply, then stood and squirmed out of the soft golden undergarment. He hadn't noticed that the room was chilly until he pulled the golden cloth away from his skin. He hurried to the bed and found some warm clothes, and dressed quickly. Once he looked like himself, he went to the kitchen. Once he arrived, he immediately felt self-conscious. Everyone was staring at him. Worse, the only person in the room who was smaller than him was Zahrinis, but that was because she was only ten years old. Even so, she was only half a hand shorter than he was. Barvil was four hands taller and Sahrena was only half a hand shorter than her husband. Dorvina was only a finger shorter than her mother. "Gods Above protect this house," he said automatically. The others replied, "And its master." Swallowing his embarrassment, Stavin nodded and stepped forward, toward Karvik's side, but Sahrena's cleared throat stopped him in his tracks. "The head of the table awaits you, Master Stavin," she said pointedly. Barvil stood behind the chair and held it for him as Stavin cautiously sat, then walked to the chair at Sahrena's left hand, where a guest would normally sit. Dorvina sat at her mother's right hand, as the oldest daughter. Karvik sat at Stavin's right hand, where he would have been at his father's side as the eldest son, and Zahrinis sat at Stavin's left. Stavin finally found himself in a situation where he knew what to do, because the guest's role was the same as the master's. "We offer thanks to the Gods Above for the bounty of the Harvest, the success of the Hunt, and the comfort of the Hearth." "Land, Air, Fire, and Water bless this house," the others replied, completing the blessing. Sahrena looked to her right and nodded. "Dorvi?" Dorvina stood and went to the side-board to begin serving the light mid day meal. Her expression was carefully neutral as she served Stavin first. Beans and corn, a piece of hard sausage, a bit of yellow cheese, and a piece of bread made up the traditional meal, and everyone waited for Dorvina to return to her seat before looking expectantly at Stavin. Stavin nodded, then began eating. Once he had taken a bite, everyone else began eating as well. The only thing that made this meal different from all the other times Stavin had shared a meal with the Kel'Carins was the silence. He was too distracted to start a conversation, and tradition demanded that everyone remain silent if the master did not speak first. Once everyone had finished eating, Stavin addressed Barvil. "I am going to go talk with my parents for a while. I don't know what to tell you to do, so I'm leaving you in charge. You know what is needed far better than I do." Barvil nodded. "Very well, Master Stavin. Everything will be in order when you return." Stavin stood and almost bowed to Sahrena, turning the mistake into a deep nod instead. "Thank you, Madam Kel'Carin, that was very good." He smiled at her, then left quickly before he made another mistake. Once Stavin was gone, the atmosphere in the room became even tenser. "This isn't right!" Dorvina said hotly. "He isn't fit to be the master of our clan." "Be quiet, Dorvi!" Sahrena snapped. "Tradition will be honored." "No buts, Dorvina," Barvil snapped. "What's done is done, and all we can do now is make the best of it. Stavin is young, but he's old enough to join the expedition and quite skilled with his weapon. We've proof enough of that. If I hadn't been so quick to disbelieve his story, we'd be having a far different argument right now. With that armor and Dragon's Tongue as proof of his courage, I'd have had a hard time finding a reason not to grant his petition for you as his wife. The Kel'Aniston clan might not rank with us, but he's the highest-ranking young man that has approached me about you." "And now the Kel'Aniston clan is far above us," Sahrena added. "Whoever your father finally approves of will have to be approved of by Stavin as well. By right, he could approve of someone without consulting us at all." Dorvina's eyes narrowed. "He wouldn't dare." "Sure he would," Karvik said from across the table. "You're no longer available to him in any way, and he can't like being around you. Every time he sees you, he's reminded that the thing he wanted most in life is farther away than ever before." Karvik's face twisted into a sour grimace. "Though I can't see why he'd want to be married to a shrew like you. He's seen your temper." Dorvina snarled and picked up her knife, but Sahrena snapped, "Dorvi!" and she put it down. "There are better men who want me." "Not many. And now, possibly none," Barvil said softly. "Your station has fallen, Dorvina. My fault, I know, but true nonetheless. You are no longer an Elder's daughter. You're a servant and the daughter of servants. The parents of several of the boys who have unofficially approached me would never accept you now. Franik I'm sure of. Elvar Kel'Coris would never allow you in his home, and Arvinis probably wouldn't even acknowledge your existence. Harner is less likely to have a problem with his parents, but Jorvan and Coriannis would treat you like a servant while he was away with the rest of the youngsters in the lowlands." Dorvina was looking back and forth between her parents in disbelief. "No! It can't be! It can't! I thought I was finally free to marry who I wanted, but now you're telling me that I'm actually in a worse position?" "Precisely so," her mother said. "Now, you and Zahri clear the table and wash the dishes." Stavin walked to his parents' house and paused at the door. Taking a deep breath, he pushed the door open and found his family still at the table. "You're a bit late, son, but there's still bread and cheese to be had," his father said as he waved him to a seat. Stavin took the seat, but shook his head when his sister tried to serve him. "I've already eaten, Sora. Thank you. Mom, Dad, I'm so confused by this. I don't know how to run a household. I'm already making mistakes. Barvil said he's grateful that he was only dishonored and not dispossessed. Sahrena is being quiet, which frightens me. Kar and Zahri are acting like themselves, but Dorvi is so smug about there not being any way she could be mine now and she's the reason I went up the mountain in the first place!" he finished hotly. Marinis nodded her understanding. "You went up there to prove your bravery to Barvil. He would have accepted you, but Dorvina is so much like her mother that she'd have refused you. I'm six years older than Sahrena, and I remember how she was when the boys came calling. She was the hardest to please of her sisters. She only agreed to Barvil when she had managed to drive all the other eligible young men into the arms of other girls." "Barvil had actually made his first trip to the lowlands before he petitioned Sahrena's father for her," Karlit said with a wry grin. "She'd driven all the other young men away, and she hadn't had a suitor in three moons. Her father said yes as soon as Barvil formally asked and had some short words for her when he announced his decision." Marinis chuckled. "We never would have dreamed of telling you this before, but you should know what you were trying to get yourself into. Like they say, even the worst storm brings rain to the fields." Sorandis reached over and ruffled his hair, then laughed when he swatted at her hand. "Now you can settle down with a nice girl and be happy." Sorandis was the youngest of his three older sisters and two older brothers, and she had come over to their parents' house in hopes of seeing him. She was two years older than Stavin, and her husband was one of the hunters out trying to bring in some fresh meat now that the winter was ebbing toward spring. "But she was the only one I wanted," Stavin whispered. Sorandis exchanged glances with her parents before continuing. "Stavi, there are girls who like you, you know. Girls who would have accepted you a moon ago, dragon's cave be damned. Not all of us are dead-set on marrying some muscle-head like Harner." "But Dorvi is," Stavin said softly as he stared at his lap. "True, but think about this instead. You, baby brother, are now the head of a household, not the youngest boy. Several of the highest-ranking girls who wouldn't have given you a second look a week ago will say yes today if you ask. Orana Kel'Davin would. She's a year younger than you, she's the highest-ranking girl of age right now, and she's being picky because she's the Chief Elder's granddaughter." "And Kar would knife me in my sleep if I did," Stavin said gloomily. "She's being picky because she and Kar have an arrangement. Kar was just waiting for Warmaster Kel'Horval to pass him before he asked. Changed status or no, Kar will ask for Orana. He might have to wait until our first season in the lowlands is done and he's won his own honor, but she'll wait for him and say yes when we return." Sorandis was rapidly looking back and forth between her brother and their stunned parents. "Since when?" "Since last spring," Stavin answered, finally looking up into her eyes. "I didn't get to go with the expedition last spring because of my size, and Kar and I ended up in the same final class. He was actually trying to help me with Dorvina. He wants her married off so she'll move away." He paused to smile sourly. "I should have known. Anyway, he told me what he and Orana have arranged." "That arrangement won't matter anymore if I know Sharvan Kel'Davin," Karlit said thoughtfully. "He won't let his daughter marry a servant, no matter who he was yesterday." "Very well then," Marinis said primly, changing the subject. "So you won't court Orana for the sake of Karvik's friendship. There are other girls. Have you considered Sharindis Kel'Horval?" "Shari?" Stavin almost shouted in shock. "She can hardly see! She spends all of her time with her books or-"
"-Or with Master Scribe Kel'Zorgan, who you want to be apprenticed to, working in the scribe's office in the town hall," Sorandis pointed out. "Her eyes aren't getting better, but they aren't getting worse either. She won't pass bad eyes to her children. After all, the fall from that horse wasn't her fault. She's two years older than you and she's resigned to being an old maid." "And she's one of your oldest friends," Stavin pointed out suspiciously. "And someone we would have suggested earlier," their mother interjected, "if you hadn't been so obsessed with Dorvina." That stopped Stavin in his tracks. "You really think Sharindis would be a good wife for me?" he asked softly, looking back and forth between his parents and his sister. "We do," Karlit said as Marinis and Sorandis nodded. Sorandis grinned and nudged his leg with a toe under the table. "There's also this to consider; she likes you. You are the only boy in town who shares her interest in the scribe's art. And there's one other thing that I have to point out, in fairness; Shari needs someone to look after her, and you suddenly have servants to do that. No other young man has that going for him." "She's almost helpless," Stavin muttered stubbornly. Sorandis looked at him sideways. "Have you ever seen her with that staff she uses as a walking stick? Gods Above, her father is the Warmaster. I've seen her embarrass warrior students with Dragon's Tongues. Her father has taught her to use every sense, and she does. She sees shadows enough to know where they are, and she hears the rest." Sorandis suddenly chuckled. "Gods Above help you in the dark, little brother." "I haven't spoken to her father yet," Stavin stubbornly maintained. "But you're thinking about it instead of obsessing over Dorvina," his father said matter-of-factly. Stavin returned to the Kel'Carin house and stopped at the door, his hand automatically reaching for the knocker. He paused before he touched it, took a deep breath to bolster his nerve, and reached for the latch instead. He opened the door and stepped resolutely inside. Zahrinis was striding toward the door and stopped in her tracks when she saw him. "I saw you coming and was going to let you in, Stave-Master Stavin." Stavin shrugged one shoulder. "I guess I'm not the only one who's going to have to get used to me living here. Where's your father?" Zahrinis tossed a glance over her shoulder. "Upstairs. He and Mom are making plans." Stavin nodded and started toward the stairs, saying, "Thank you, Zahri." "Stavi," Zahrinis said in a small voice, "you aren't going to be mean about Dorvi, are you?" Stavin stopped and looked her in the eye, then shook his head. "No. No, I'm not going to be mean. I just had a long talk with my parents about Dorvi. I've been given a lot to think about, and I need to talk with your parents before I make a decision." "That sounds so strange," Stavin muttered to himself as he once again headed up the stairs. He found Barvil and Sahrena in what had been the guest's bedroom. "Barvil, Sahrena, may I have a few moments of your time?" he asked cautiously. "Of course, Master Stavin," Barvil said and they both turned to face him. Stavin couldn't hide his grimace at their instant obedience. "Sahrena, how well do you know Nahrana Kel'Horval?" Sahrena considered him carefully for a moment before she answered. "Quite well, Master Stavin. We have both been on the town's Defense Planning Council for several years." Stavin nodded and looked at Barvil. "I know that you and the Warmaster are close friends and allies in the Council of Elders, Barvil," Stavin said, then reddened in embarrassment at reminding the man how far he had fallen today. "Sorry. Anyway, it's good that you both know them so well because-what do you think of me asking Warmaster Kel'Horval for Sharindis to be my wife?" he finished in a rush, then held his breath. Barvil and Sahrena shared a glance, then Sahrena stepped forward and put a hand on Stavin's shoulder. "Are you seriously considering her, or do you just want to know what we think?" she asked, then added, "Master Stavin," almost as an afterthought. "Sora said, well, Sora said that Shari likes me." "And you are asking us why, Master Stavin? It isn't our place to advise you on such things. You are the master of this house." Barvil spoke softly, but he was completely serious. "I know," Stavin almost cried, "but I don't know! I don't feel it. If I ask for Shari, she will become Mistress of the house when Kar and I go to the lowlands with the other caravan guards. I guess what I'm asking is how you feel about it. If I was at home-but I'm home here now-she'd be mistress, but she has to be cared for-"
"I understand, Master Stavin," Sahrena said gently, smiling softly for the first time. "You are concerned about taking Sharindis from her family and placing her in a position where her lack of sight would place her at our mercy. Don't trouble yourself, Master Stavin. Shari is my Goddaughter. I would care for her as my own, mistress or child." Evidently seeing the confusion on Stavin's face, she went on to explain, "I was far closer to Charvil than Nahrana. We are of an age, and were all but inseparable when we were little, but we knew each other far too well to marry when our turn came. If you are truly serious, I can think of no other girl I would rather have as mistress here." Barvil was staring at his wife. "Nineteen years, and still you have secrets." He turned his attention to Stavin and bowed. "You should wear that armor, Master Stavin." He gave a wry grin. "Charvil is going to want to inspect it anyway, and it does look impressive." Stavin automatically bobbed his head and said, "Yes, Sir." Barvil managed not to roll his eyes as he motioned toward the door. "After you, Master Stavin." Stavin and Barvil left the house a short time later. There were curious stares now, and Stavin felt very self-conscious, but no one approached them as they made their way to the center of town. There stood the ancient fortress that was the last-bastion defensive position in case of attack and that also served as the town hall and academy. The school where all of the children learned to read, write, and figure was under the control of the Master Scribe. The training grounds where boys became warriors were also there, under the constant gaze of the Warmaster. Charvil Kel'Horval saw them enter and immediately left his pupils under the supervision of an assistant. "Well, this is convenient, Stavin. I was going to stop by this evening and ask for a closer look at your new armor." Stavin came to attention and froze as the Warmaster inspected his armor in minute detail, checking the straps and the fit of the plate. He fingered the mail appreciatively, and hummed a little when he checked the helmet. "Magnificent. Absolutely magnificent. You say it's made of dragon scale? If what I've heard is true, only magic or time can scratch dragon scales. Allow me to check your weapon," he commanded. Obediently Stavin raised the Dragon's Tongue and presented it to the Warmaster on his open palms with his head bowed. Charvil took the weapon and stepped back, then ran through a series of moves that tested the weapon in every way possible, ending with a lightning-fast strike at a wooden post. The dragon-wrought edge sheared cleanly through the two-hand thick tree trunk. The Warmaster stared at the piece of post in awe for a moment, then studied the weapon in his hands. He returned it to Stavin's upturned hands with a deep nod. "It is superior to any weapon I have ever used." Stavin looked at his weapon with pride, then the sound of a cleared throat from behind him reminded him of why they were there. Dropping to his knees, he placed his forehead against the ground, but carefully kept his weapon in his hands. "Charvil Kel'Horval," Stavin said loudly so there could be no confusion about what he was doing. "I petition you for Sharindis, your daughter, to be my wife." He was fully aware that all activity on the practice grounds had stopped the moment he went to his knees. Charvil looked down at the boy kneeling in front of him, then up at the man standing behind the boy. Barvil grinned and shrugged, then looked down at Stavin to get Charvil's attention back where it belonged. Remembering his duty, Charvil continued the ritual. "Stavin Kel'Aniston, why do you choose my daughter?" Stavin again spoke loudly. "I choose Sharindis for love. I choose Sharindis for life. I choose Sharindis for the mother of my children." Charvil thought for a moment, then departed from the ritual. "Do your mother and father know about this?" "They do, Warmaster," Stavin answered without looking up. "Very well. Stavin Kel'Aniston, you have proven yourself to be a courageous and honorable young man." To his credit, he didn't glance at Barvil. "I grant you Sharindis, my daughter, for love, for life, and for the mother of your children." Stavin quickly scrambled to his feet and bowed deeply. "I thank you, Warmaster." Charvil chuckled. "I suppose I should be thanking you, Stavin. I'm curious, though. You've never shown any real interest in Shari before. Why did you decide to ask for her now?" Stavin looked down and sighed. "Sora. Dorvi can never be mine, and with my mind clear of my obsession, Sora pointed out what I think I've known all along. Shari and I are cut from the same cloth, if not the same pattern. Once I could see her clearly, I saw someone who can probably tolerate me and my books." He looked up at Charvil's puzzled expression and smiled sheepishly. "With your permission, Master Stavin?" Barvil asked, and at Stavin's nod, said to his cousin, "We've talked about this over beer often enough, Char. Shari isn't going to be able to run a household and manage children by herself. Master Stavin, through the agency of my bull-headed pride, has a household where Shari will have the help she needs. When Master Stavin completes his five summers in the lowlands, he will be free to follow his scholarly bent. By taking Shari to wife, Stavin is setting up a household where he will have someone who understands him far better than if he had succeeded in his desire for Dorvi." Charvil gave Barvil a quizzical look and said, "You aren't his father, Bar. Besides, I already said yes." Barvil looked chagrined. "It seems that the children aren't the only ones who have some adjusting to do." Turning to Stavin, he bowed deeply. "My apologies if I have overstepped myself, Master Stavin." Stavin was caught off-guard, but recovered quickly. "You meant well, Barvil. There is nothing to apologize for." Turning to the Warmaster, Stavin bowed again. "I ask you to come with me to your daughter so that she may hear this news from your lips." "As is proper," Charvil agreed, then added, "and prudent. Shari doesn't always take surprises very well." The three men walked the short distance to the town hall archive. Sharindis was in a corner of the scribe's office where the window provided bright sunlight for most of the day. She was using a large magnifying crystal to let her read the parchment she was copying. Raising her head at the sound of the door opening, she could see three shadows by the door in the overall gloom of the room. "May I help you?" she asked courteously. "Shari, Stavin Kel'Aniston has petitioned for you to be his wife," Charvil said. "I have granted his petition." Sharindis looked at the three shadows and focused her attention on the short one. "So, your first choice said no, and now you turn to me, the poor second? Or am I even that far up your list?" she asked sarcastically. Stavin looked at the floor and cleared his throat. "Shari, I beg your forgiveness for my inattention and obtuseness. I had considered no other women to be my wife while I was pursuing Dorvina. My obsession was such that no other woman registered on my consciousness, but now I see that you have always been there, always at the edge of my perception." He took a deep breath and said, "I give you right of refusal without reservation." Sharindis' gaze stayed on the short figure between the two tall ones. "And if I should refuse you, who then will you ask?" "No one." Stavin looked at her from across the room, knowing she couldn't see his eyes but not caring. "I will go to the lowlands and seek an outlander bride, for no other girl of our people draws me." Sharindis let the silence grow for a moment, then said, "I do not refuse you, Stavin." Stavin let out a breath that he didn't know he had been holding and heard two other sighs of relief as well. "I greet you, wife, and give to you my name, and with my name all that I possess." Sharindis completed the ceremony in a voice that was strangely muffled. "I greet you, husband, and receive from you your name, returning my father's name to him as a woman must. My dowry is modest, but I do not come empty-handed." That caught Stavin off-guard and he looked at Barvil and Charvil, but neither man seemed fazed in the least. Taking a breath, he answered, "Your dowry is yours to do with as you wish." Sharindis suddenly giggled. "That's good, since it's mostly bedclothes and a goose-down comforter. There is some coin, though not much, and a few knick-knacks as well." She transferred her attention to the third shadow. "Who is there?" "Barvil," he answered, then added, "Mistress Sharindis," after a brief pause. "It's true, then?" she asked in a breathy voice. "I heard people talking-"
"It is true, Mistress Sharindis," he assured her. "Shari, take the rest of today and the next two off to settle your household," a voice said from the doorway, and the men turned to find the Master Scribe behind them. "Allow me to be the first to offer you my congratulations on your marriage." "Thank you, Master Kel'Zorgan," Sharindis replied in a bright, happy tone. Stavin bowed and said, "I also thank you, Master Kel'Zorgan. Since I have others to see to my needs, I will not be depriving you of your assistant." "I wouldn't have allowed you to, Stavin. Shari is much too valuable to me to allow that." Glancing at Barvil, he nodded once, sharply. "You'll see to it that I'm not deprived of my assistant, won't you?" "As my master and mistress command, Master Scribe," Barvil said. His voice was properly respectful, but there was a gleam in his eyes. "Considering how hard I had to lobby the Elders to get her, I find that comforting." Turning his attention back to Sharindis, he let his smile show. "Run along now, Shari, and tend to your household." Sharindis had been putting away the tools of her trade while the others were talking, taking extra care to put her crystal in its box and latch the lid. Her hand reached out unerringly to grasp her staff as she stood, but she didn't use it as she threaded her way confidently through the cluttered office to Stavin's side. She reached out to grasp his arm, but stopped when her hand encountered his mail. Her fingertips explored it lightly, running up his arm and across his breast plate. "Armor?" she asked. "He can explain when you get home, Shari," her father said. "It's a good tale, one I'm sure you're going to be writing several times." Turning her head toward Stavin, she grasped his arm firmly now. "I shall be most interested to hear it." All that Glitters Copyright © 2016. Loren K. Jones. All rights reserved by the author. Please do not copy without permission. This page last updated 07-14-16.